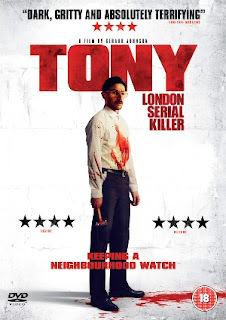 "Tony" is the rare exception where the term 'indie horror' means smarter rather than just cheaper. On one level, it's a pretty simple premise (man commits crimes, man goes unnoticed until...), but on another, it a phenomenal character study of a man to whom desperation is a constant companion, to whose hobbies others would find sickness and perversion. 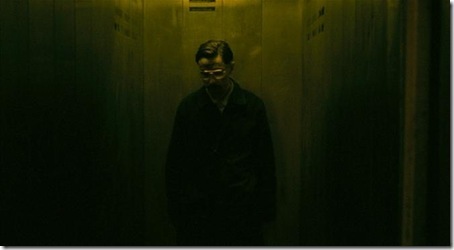 All that and a highly effective performance by unnoticed actor Peter Ferdinando, as the titular killer. Tony is a lonely fellow who idles away his days watching low-grade 80's action films. We see him desperately trying to make a connection with the uncaring world around him, but socialization is hard, especially if your second hobby is, well... killing people. The murders are sporadic and not overly graphic. Tony just gets fed up with humanity. Don't we all? Tony is unwashed, dirty, and unemployed. He lives off the U.K. welfare system without having done a real day's work in his life. He's haunted by memories of his abusive father. It's hard not to feel bad for him as he navigates an apathetic London, and hard not to be repulsed as he cohabitants in his filthy apartment with the corpses of his victims. First you might consider the place of Tony's action films. Are the driving him to kill? Probably not, the movie suggests. People drive people to kill, the media is scapegoated. I am reminded of an eight-year-old boy who took a break from "Grand Theft Auto" long enough to shoot his elderly caretaker in the head. All the things you can find obviously wrong with that family (guns unlocked, eight-year-old's playing restricted games,) and the video game becomes the scapegoat. It's easy. It's too easy. Sorry for that tangent. Anyway, "Tony" is grim, and sometimes very gross, but don't expect a "Human Centipede"-style torturefest. An interesting fact Tom Six made "The Human Centipede II"'s lead Laurence R. Harvey watch this movie for inspiration on his character, 'Martin.' A great performance inspiring another. "Tony" reminds me of what THC2 could have been if Six had concentrated on character development rather than cutting ligaments and pulling out teeth with pliers. At the center of "Tony" is Peter Ferdinando's fearless performance, playing a sick, sick character with a glimmer of empathy. The other actors back him up nicely, although in the end it's solitary Tony, friendless, unchanging, and scrutinizing a world he can't quite understand. And indulging in his second favorite hobby, of course.